Since I’m not feeling too great, I think this is a perfect breakfast for those lazy morning when you just don’t want to get out of bed. My day basically consists of oatmeal (oh so warming!) with chicken soup and then more chicken soup. Which is totally ok with me, because it screams warm comforting nights! 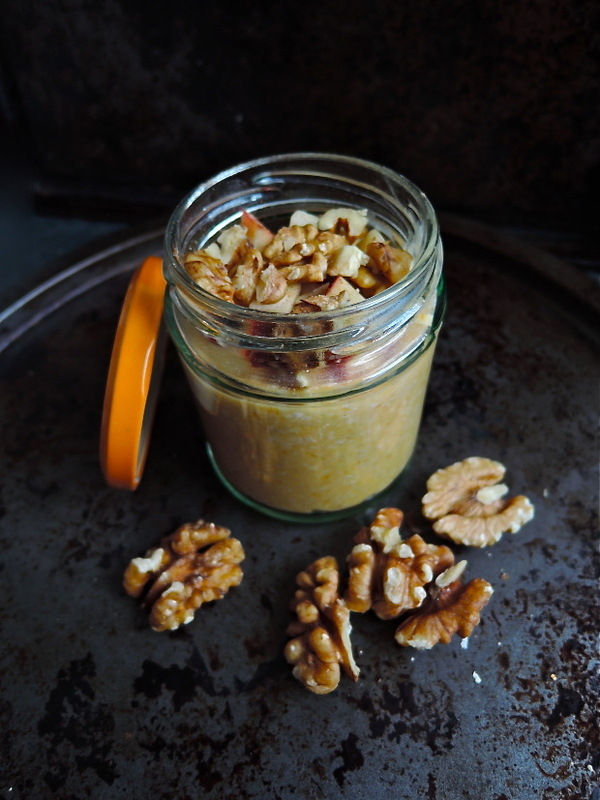 A delicious and easy breakfast in the cold months when you want that extra 15 minutes in bed! Sweet notes from the pumpkin comes through whilst the cinnamon gives a Christmassy flavour! This recipe can also be warmed up on the stove top in the morning or baked for 20 minutes at 180ºC. Mix the water, puree and oats together. Set aside or put in the fridge for an hour or overnight. 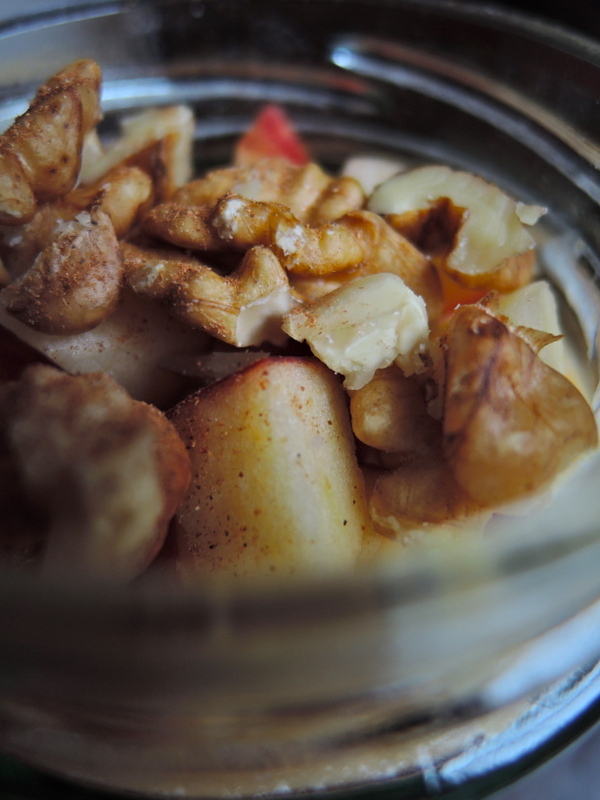 I like to serve in a cute jar with chopped apple and walnuts. This puree is perfect for any dish, sweet or savoury! You can make it into a soup, pasta sauce or even use it for pies! Also feel free to make it with kabocha or butternut squash. Cut pumpkin in half and poke holes in it and sprinkle with salt. Place face down on baking tray and bake for 45 minutes. Poke with a fork and it should be soft. If not, leave in for another 15 minutes, facing upwards in oven. Once cooked, spoon contents into a blender and blend until smooth. Great idea Lorriane – hope you can try it out!! 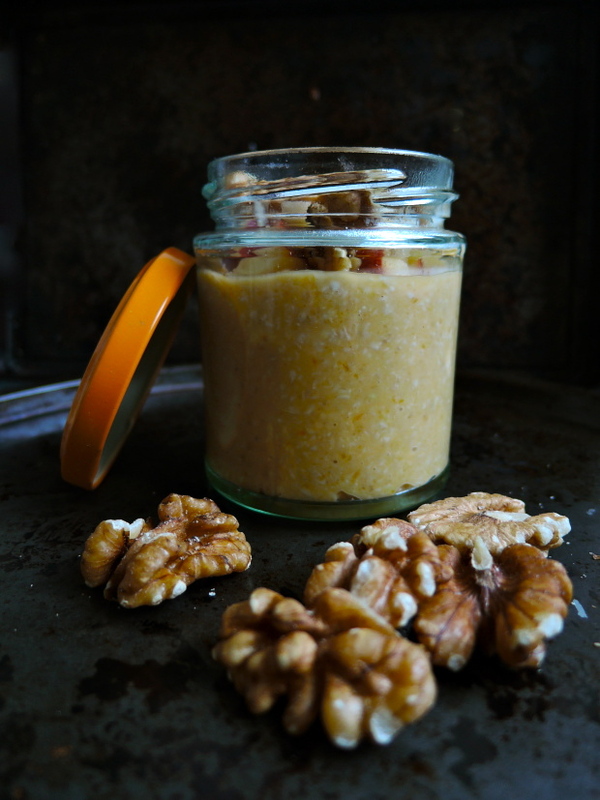 Love overnight oats.. and your pumpkin version looks and sounds incredible delicious Millie! 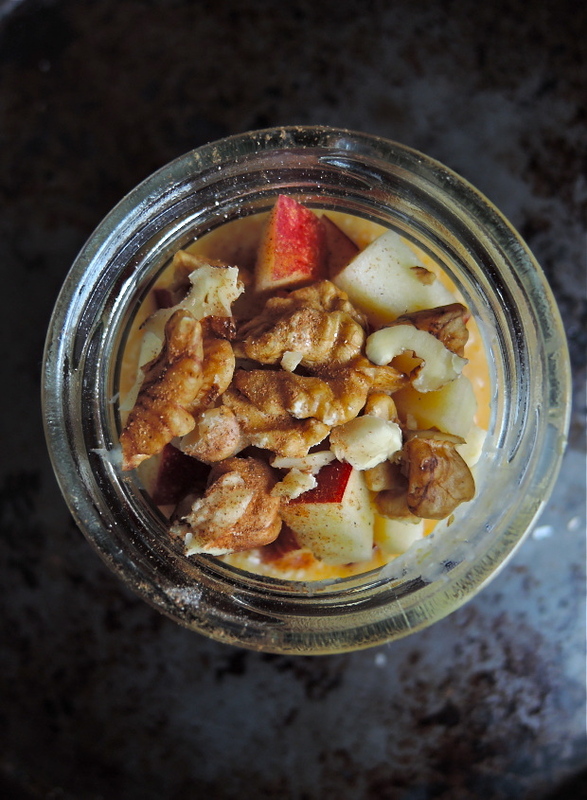 Thanks so much Shu Han – overnight oats are such a great idea for busy people and delicious with chia seeds to keep you more full! i attempted overnight steel cut oats for the first time last night and have been brainstorming toppings. i think using up pumpkin (or squash) puree is a great idea! Thanks Lan – I feel much better now 🙂 hope you get to try out the pumpkin topping!